Village sites from the Terramare culture are easy to find. Locals have been 'mining' them for centuries for their ultra-rich soil (caused by the huge amounts of rotted wood where the homes once stood). Here, in a site just south of Modena, archaeological excavations have been followed by the creation of an 'open-air museum' to give us an idea of what life for the Terramare people was like. Two of the thatch-roofed capanne (cabins) have been reconstructed, along with a gate and part of the wooden-walled fortifications. The walls would have surrounded by a moat, as in all Terramare villages; these served not only for protection, but as a water supply, connected to the system of canals that kept the fields well drained. The houses, roofed with thatch and built up on piles to keep them off the damp ground, are furnished with household items copied after finds on the site. 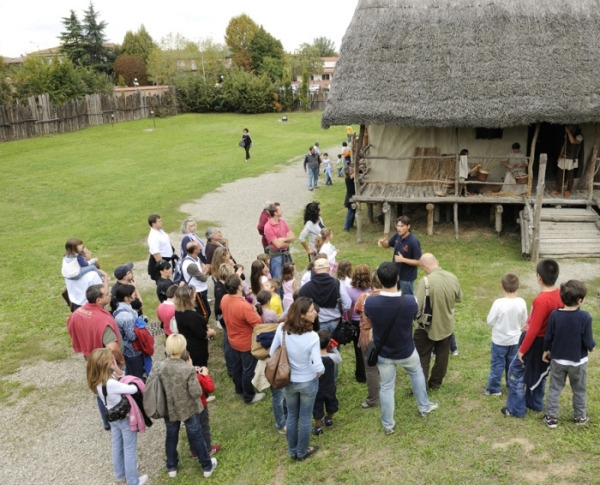 The open-air museum includes a small farm with Terramare-era crops, and a kiln; demonstrations of pottery techniques and other ancient crafts are given on Sundays, or when school groups are around. Hours Open May, June, Sept and Oct, Sun and hols only, 10-1.30pm and 2.30-7pm, until 6pm in Mar and Oct.